Sopwith, to Gunship 2000 and Red Baron. I just can’t seem to get enough of simulated flight. In a way I think early flight simulators were forerunners to today’s open world, sandbox games. All a game needed to do was give me a small plane, limited fuel and a runway and I could be entertained for hours — performing stunts, attempting more difficult landings and playing with the weather settings. Maybe my attraction to virtual flight is rooted in my fear of heights and flight sims give me the ability to soar through the clouds without panic. Maybe it’s the freedom that can be found in a flight game that, until recently, was rare in other genres. Whatever the reason, I love to pretend to fly. Which brings me to my entry into Linux. When I first got into the open source world I ran into a number of challenges, perhaps the biggest was my unsupported winmodem. Also near the top of the list was a lack of suitable printer drivers, but somewhere in my list of issues was a perceived lack of good flight simulators. Granted, now we have FlightGear and, if you’re open to commercial offerings, X-Plane. But at the time, the pickings looked pretty slim. Even now, for people running lower-end video cards, the selection still feels a bit limited. This leaves me always on the look-out for a new-to-me flight game, particularly ones which involve optional combat components. A little while ago I stumbled across GL-117. The GL-117 website tells us that the game is an action flight simulator which runs on most major operating systems. The player pilots jet aircraft through various training missions and campaign settings, presumably causing mayhem along the way. There are several different graphics levels, input settings and weather options. Judging from the screen captures I gathered that GL-117 had somewhat primitive graphics by modern standards, but they were good enough to be interesting. A nice fit for my somewhat limited video card. A quick check shows that GL-117 is available in the package repositories of Debian (and its many children), Fedora, FreeBSD and other big-name projects. Upon installation, the program added itself to my Games menu and I fired up GL-117 for the first time. The intro screen shows a plane (F-16, I think) flying over flames while a banner asks us to protest software patents. We’re then shown a menu while, in the background, we see our plane flying over green hills while an air battle rages around us. 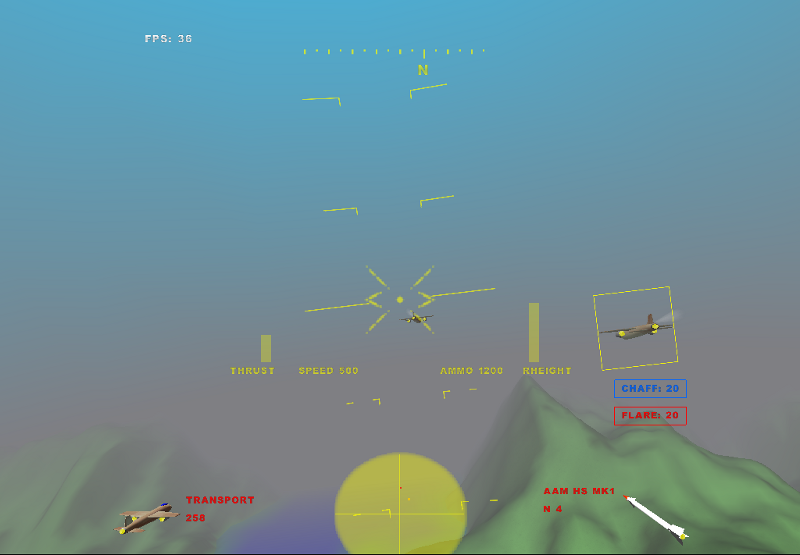 The main menu is broken into two parts, general categories (Pilots, Training, Campaign, Options and Credits) are shown on the left. More specific details are displayed on the right. The Pilot menu allows us to create new characters and delete player characters. The Options menu contains three sub-sections, Video Audio and Game. Here we can change the resolution, switch between windowed and full screen and adjust the detail settings for the environment. Audio is pretty straight forward and lets us adjust the volume of music and sound effects. The Game tab lets us change the combat difficulty, switch the physics type and select which input device to use. On my machine the input control defaulted to the mouse and I found the resulting stick action was too jumpy. Changing over to the keyboard controls gave me a much smoother experience. The two available physics models are Action and Simulation. Honestly, I didn’t find much of a difference between these. I suspect that the plane responds more to drag and gravity under the Simulation mode, but picking one or the other didn’t make a serious impact on my flying. On that note, let’s talk about the flying. GL-117 is kind to its players and provides four basic training scenarios. These include one on basic flight controls, one on attacking ground targets, one on air-to-air combat and one covering the physics of flight. In each case the player is guided through the training with text explaining how to turn, cycle through weapons and use the targeting system. The tutorials are pretty forgiving and give the player a taste of the various types of missions. Something which quickly becomes apparent is that the game does not expect us to take-off or land the airplane, nor does it require us to consider pesky details like fuel. As far as the game is concerned we are here for the combat. To that end the training section is rounded out with some more advanced missions in which we are given target practice, the chance to fight off waves of fighters and engaged in team vs. team combat. There’s also an fighter-plane version of Capture The Flag. Through these missions I found there are aspects of the game which surprised me. The planes (both friendly and foe) are pretty tough, often taking multiple missiles and/or gun fire before exploding. This can be frustrating if you’re winning or a blessing if an enemy caught you by surprise. The radar system I found difficult to get used to. Unlike other flight games I’ve played in the past, GL-117’s radar zooms in or out automatically. This sometimes means dots at the edge of the display are very close and, at other times, targets may be far away. The radar screen is also transparent, which makes for a nice effect, but means flying in certain environments can wash-out the display. Next up are the campaign missions. These have the same basic format as the training missions, but must be completed in order. There’s a pretty good variety of scenarios, starting with destroying some ground targets and play-fighting against an enemy aircraft. The missions then evolve into shooting down specific planes, classic dog fights and attacking or defending ground structures. The development team has taken a fairly simple formula (jet fighters, missiles and surface guns) and put together a good variety of challenges. As the player progresses through the missions new types of planes are introduced on both sides allowing for more interesting combat combinations. For the most part, I found I stuck with the same two planes most of the way through, but it’s nice to have the option to branch out. All the missions throw the player straight into the combat without worrying about take-offs, landings or patrols. Personally I would have liked to have seen a mission which involved landing on an aircraft carrier or taking off during a surprise raid against the player’s airfield, but one can’t have everything. Earlier I mentioned that the graphics weren’t all that impressive and that’s true, by today’s standards the terrain and other airplanes have a simple appearance. However, what was done with these graphics in terms of the game’s atmosphere is impressive. It didn’t really hit me until I was flying a night mission against enemy ground defences during a lightning storm. The way the components came together with bolts of lighting streaking through the dark, streams of tracers buzzing past the cockpit and, when I got too low, trees whipping back and forth in the wind really provided an intense experience. Some of the more tame vistas are nice to look at too and there’s an air-to-air mission which takes place over the sea and it’s pleasantly distracting to see the sun shining on the waves and the green islands rising out of the water. In general this is a style the game the keeps using: take some simple components and piece them together to make something interesting. Not just with the graphics, but also the controls, the mission pieces and the available airplanes. At the end of the day what matters most is whether a game is fun and I think GL-117 is indeed fun. Fun is an ingredient many games seem to leave out these days, preferring instead to keep us in the grind. I’m not interested in washing the airplane or driving the pilot to work every morning. I’m not interested in becoming a level twenty-five half-human test pilot with extra skill ranks in barrel rolls. No, what I’m looking for is some quick entertainment. With any game it’s possible to say I’d like more of A or I wish it did B, but the bottom line is I found GL-117 entertaining. It’s well worth taking a look at if you’re into air-to-air combat games and open source software.